Proper break-in after an engine rebuild is one of the things that we find a lot of our customers don’t know about. Because it’s so little known, we wrote another blog about it, which you can find it here. Another thing that most people don’t realize is that break-in isn’t complete after that first high-horsepower session. In reality, An engine is fully broken in when it does not lose any oil, which can take months for even the most active of engines. The long time extended diesel break-in period period of break-in means you still have to be careful about how you run your engine. For the first few months after initial break-in, try to keep it from idling as much as you possibly can. Whether you’re getting fuel or need to run back into the house because you forgot to grab a snack for the road, turn your engine off rather than keep it running. It also means you’re going to have to change the way you change your oil. We know how expensive an oil change can get for a heavy duty diesel engine, but an extra oil change or two is nothing compared to ruining break in and having to rebuild your engine all over again. The first oil change should be no more than 500 miles after you start your engine for the first time. Getting it changed soon is important for removing any contaminants that may have gotten into it during the rebuild, as well as any metal particles that get in it during break-in. When the piston rings and cylinder liners first make contact, they’re not quite sealed. The first initial break-in is what pushes the rings up against the cylinder. The longer break-in process is what perfectly seals them. Cylinder liners are made with tiny grooves on the inside of the cylinder, which create peaks and valleys. As the engine runs for the first few months, the rings sliding up and down in the cylinder wear down the peaks. Essentially, the rings finish machining the cylinder liner. This creates better sealing, but means that minuscule particles of iron get into your oil and have the potential to ruin your engine. 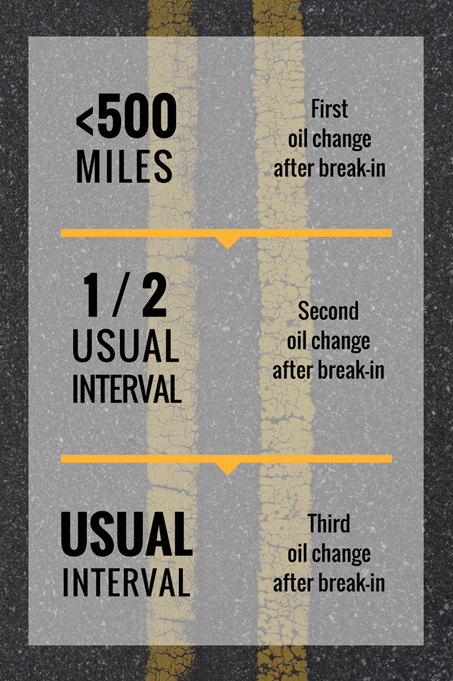 The second oil change should happen at approximately half the usual interval. For example, if your engine’s typical oil change interval is 15,000 miles, the second oil change after rebuilding should happen at around 7,000 miles. At the 7,500th mile after rebuild, you should have changed your oil twice. Starting with the third oil change, the engine is considered fully broken-in and is ready for standard interval oil changes. When changing your oil, make sure to use conventional motor oil for the first few changes. Synthetic oil is too slippery for proper break-in, and should not be used until months after the rebuild. Another tip for the first oil change after rebuild is to use either break-in oil or additive. Break-in oil is especially clean of contaminants, which helps out when the peaks of the cylinder liner get machined down. Most break-in oils are also high pressure oils that keep the oil from scattering under the intense pressure that can occur during break-in. We hope this will help you make sure your engine runs to the best of its ability. Highway and Heavy Parts is fully committed to the success of our customers. If you have any outstanding questions about oil changes after break-in, or general questions you need answered, please give us a call at (844) 215-3406.